With an increase in coyote sightings in recent weeks, the City of Myrtle Beach has scheduled a public meeting to provide more information and seek additional help. 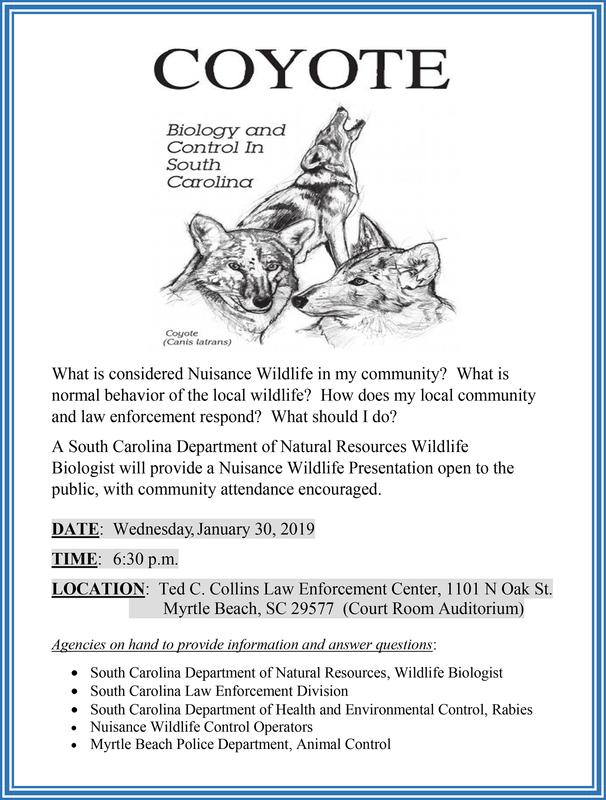 The Myrtle Beach Police Department hosts a South Carolina Department of Natural Resources Wildlife Biologist to discuss coyotes and nuisance wildlife at 6:30 p.m. on Wednesday, January 30, in the courtroom auditorium at the Ted C. Collins Law Enforcement Center, 1101 North Oak Street. Additional agencies in attendance include the city’s animal control division, South Carolina Law Enforcement Division, South Carolina Department of Health and Environmental Control and Nuisance Wildlife Control Operators. Topics covered include what is considered nuisance wildlife, normal behavior of local wildlife, how does local law enforcement respond and what community members can do. The educational event is open to the public, and concerned citizens and locals are strongly encouraged to attend. Questions about the event? Call Myrtle Beach Police Department Crime Prevention Officer Stephani James for additional information at 843-918-1806. The city provides a brochure about coyotes, including information on legal trapping and eradication, as well as tips to avoid inviting coyotes onto your property. See http://www.cityofmyrtlebeach.com/Coyotes.pdf.